Lisbon – Hostels in Lisbon. Maps for Lisbon, Photos and Reviews for each hostel in Lisbon. Looking for a hostel in Lisbon? Look no further, all the good deals in Lisbon are on Dorms.com. Like thousands of other people every month, book your hostel securely at the best price in all neighbourhoods of Lisbon. 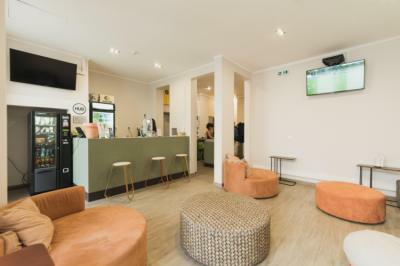 On this site, you can easily find a hostel downtown, in a trendy neighbourhood; a hostel in the student- university district, close to bus or train stations, airports or major attractions of Lisbon. 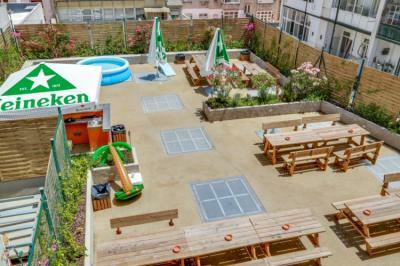 Between Avenida da Liberdade and Saldanha, Hub Lisbon Patio Hostel is the perfect place to stay where the locals are. At a walking distance from all the main sights in Lisbon like the famous Alfama district and the Baixa, we are the perfect place for an amazing experience in Lisbon! 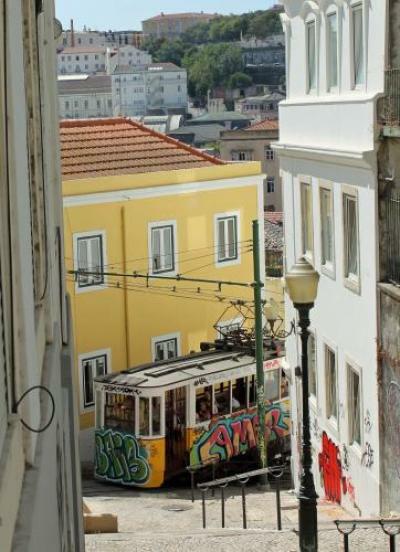 It is an 8-minute walk to the Bairro Alto and its assorted bars and nightlife options. The Lisbon city centre is a 3-minute drive and features many shops, cafés and restaurants. The famous and scenic Santa Justa Lift is just across from the hostel, and the Tagus riverside is also within 5 minutes’ walking distance. 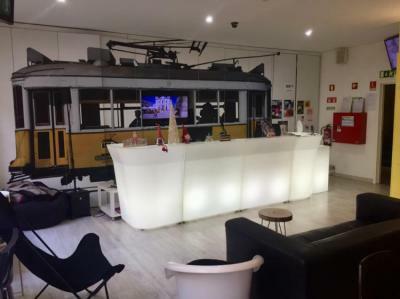 The Golden Tram 242 Lisbonne Hostel is a 15-minute drive from the Lisbon International Airport. The Baixa/Chiado Metro station is a 2-minute walk and also connects with the airport. Very good hostel, clean and nicely laid out. Very nice team. Breakfasts and towels provided. Close to all amenities, and downtown easily accessible by transport. I recommend. Great location, very good facilities. The walk up the hill to São Jorge Castle takes around 20 minutes and it can also be accessed by a tram that stops a 5-minute walk from Hostel Vistas de Lisboa. Within 2 minutes’ walk there are bus stops, and a tram to Belém, home to a tower surrounded by the Tagus River. Located 200 m away is Santa Justa Lift and 100 m further are the ruins of the Carmo Convent. Rossio Train Station is 500 m away and Lisbon International Airport is 7 km away. Lisbon is a walking city but if you’ve worn holes in your shoes or you’re dragging truckloads of shopping with you just jump on the metro. The Picoas (yellow line) and Parque (blue line) stations are just around the corner from the Brinker. From there, the metro will take you to and from the old city center in 5 -10 minutes. Our staff is certified Lisbon experts and they’re more than happy to tell you where to go (and how to get there). The staff of the hostel is very welcoming and attentive to the slightest requests. It makes sure that you have a good stay and that you feel comfortable. In terms of hygiene, it's ok. Cleaning in the toilets and showers is done daily. Breakfast is full and is served between 08:00 and 10:30. The view from the various balconies is pleasant: it overlooks the street dos Douradores which leads directly to the square of Figueira (very animated!) Or on a small square quiet and wooded street of Santa Justa. Too bad that the mattress bunk beds are so thin and my back has suffered as much! However, the people (including a Korean lady, a Dutch girl and a Argentina girl) who shared the room with me were very friendly, and I shared good times with them! 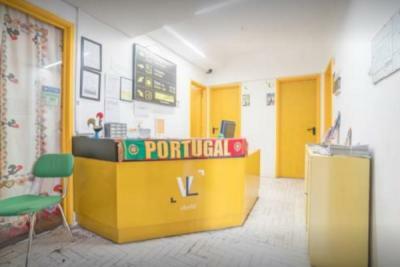 I recommend this hostel at the level ratio / price, because it is really in the center of Lisbon (the Rossio Metro line and the various trams are really a minute) and it is really cheap! Hostel convenient to visit Lisbon but not suitable for everyone. Noisy dorms, not always clean. Well organized, but with rooms that are too basic, small and with little air. Discreet, simple but sufficient breakfast. Bad location and the building where it resides. / Well organized, but with rooms that are too basic, small and with little air. Discreet, simple but sufficient breakfast. Bad location where the building is. Located in one of the old largest factories in Lisbon, The Dorm is part of a charming piece of Lisbon hidden from the world for years and is called LXFACTORY. This creative island, previously occupied by industrial professionals, is now the stage to a diverse range of events; fashion, advertising, arte, architecture, music, etc. Generating a dynamic pivot which attracts countless visitors, this urban artistic area of Alcântara LXFACTORY promises you loads of fun! Nested between Bairro Alto and Príncipe Real, Hub New Lisbon Hostel has the best location for the bohemians. Botanical garden, belvederes, bars, design shops, cool restaurants. 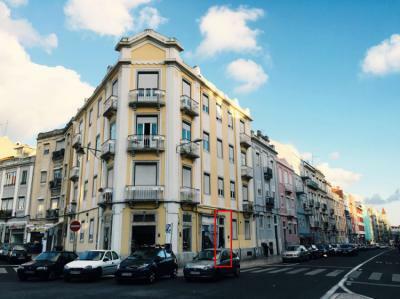 Traditional and historical neighborhoods Chiado & Baixa walking distance. An incredible hostel! Located in the district of LX Factory we like it a lot! Arrived with a group of friends (8), we were very pleasantly surprised at the quality of service and location. To all those who want to visit Lisbon, come with your eyes closed! I spent with a friend a very pleasant stay at this hostel! Everything is nice and clean, the ball pool, billiards and the cozy common room are real pluses. The downside would be the cries of groups of teenagers, who certainly need to speak but perhaps not so thundering ... but it would be the same in any other hostel. A very attentive staff, an inn where you feel really good! The setting is really nice and all you can expect from an inn is there! Nothing to say :) I will return without hesitation and advise with eyes closed! The Nicely Hostel is located in central Lisbon. In the same place we have all kinds of trade: Shops, Restaurants, Supermarkets, gardens, coffees ... The hostel is close to the illuminated fountain in Alameda (Fonte Luminosa) and one of the main avenues of Lisbon. It is spotted right in the centre of Lisbon and yet you feel the atmosphere of the neighborhood: real people, real shops, great photo angles and plenty of greenery at the park just behind. It is pleasant and quiet yet everything is easily accessible either walking or by public transportation. The hostel is really cheap but not exactly what you expect from a hostel. The shared spaces are very small: there are only two bathrooms that are not suitable for a hostel because everything is in the same room (shower, sink, toilet), a very small kitchen and a small and not very pleasant lounge . You have to queue to go to the bathroom, so it's less pleasant than in other hostels where there are normally several sinks, showers and toilets available. The hostel is an apartment in a building, turned into hostel, so if you want a minimum of space I do not recommend. There are also no usual hostel activities: city tours, outings etc. After the price is very low so I recommend if you want to save money. Cheap host, home that does not speak English very well. We do not go for cleanliness, nor for being in the city center.